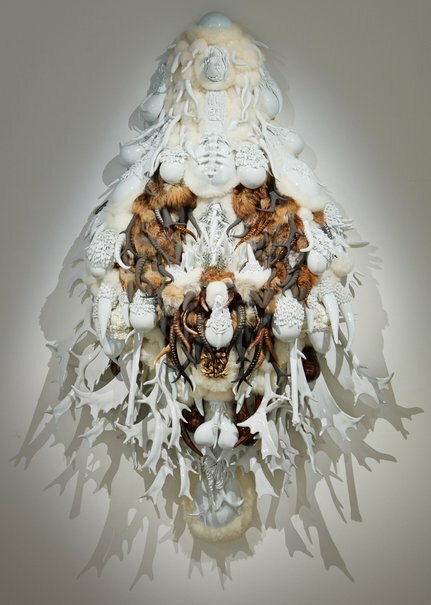 This installation is a heady mix of artefact and disturbing viscera, a kind of contemporary shamanism, playing with representations and perceptions of the human and animal condition. The universal language here represents the outsider versus the insider, acceptance and isolation, connection and displacement – a theme that is constant in the lives of people living in remote areas, though is ultimately united by the human condition. The juxtaposition of inanimate materials is suggestive of the cycle of life. It also creates the sense that the work is alive, in an ironic way, as all living things decay.